Photos from the February 2018 Sangenkai Workshop in Hawaii with Dan Harden held at the Windward Aikido Club in Kaneohe, Hawaii. A two day open workshop followed by a five day private intensive workshop for the Australian Sangenkai group. Participants came from around the world - Australia, New Zealand, Singapore, Korea, Japan, Sweden, California, Washington, Massachusetts, Canada, Hawaii neighbor island and our local Oahu folks (hope that we didn't miss anybody!). This continuing series of workshops are the only Aikido workshops in Hawaii that have a regular international attendance and have been held on Oahu and the Big Island of Hawaii since 2010. Photos from the December 2016 Sangenkai Workshop in Hawaii with Dan Harden held at the Windward Aikido Club in Kaneohe, Hawaii. This continuing series of workshops are the only Aikido workshops in Hawaii that have a regular international attendance and have been held on Oahu and the Big Island of Hawaii since 2010. 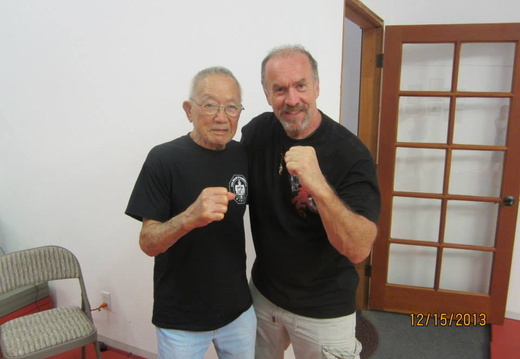 Photos from the December 2015 Sangenkai Intensive Workshop in Hawaii with Dan Harden. 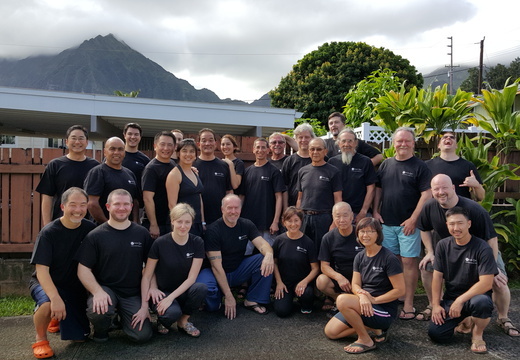 Held December 3rd - 6th 2015 at Windward Aikido Club in Kaneohe, Hawaii. The workshops included participants from Great Britain, Japan, Australia and the U.S. Mainland, as well as from Hawaiian neighbor islands and our local Oahu Sangenkai members. 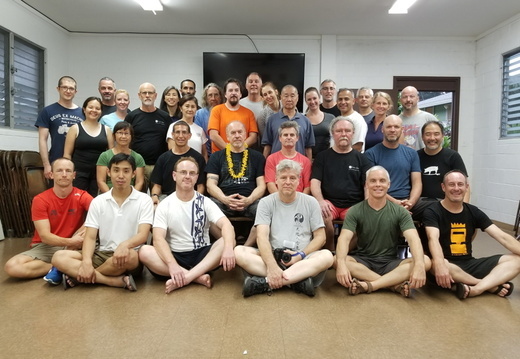 Photos from the first Sangenkai Intensive Workshop in Hawaii, marking the 5th anniversary of the "Internal training, Aiki and Empowering Aikido" workshops with Dan Harden held in Honolulu on Oahu and in Hilo and Kona on the Big Island of Hawaii several times per year since 2010. Held March 27-30, 2015 at Windward Aikido Club in Kaneohe, Hawaii. The workshops included participants from Canada, Australia and the U.S. Mainland, as well as from Hawaiian neighbor islands and our local Oahu Sangenkai members. 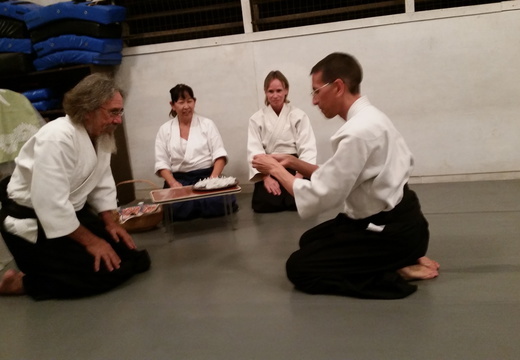 Kagami Biraki, Wednesday January 7th 2015 at Windward Aikido Club in Kaneohe, Hawaii. 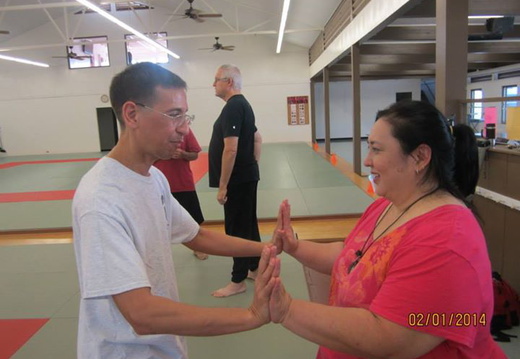 Photos from the July 2014 "Internal training, Aiki and Empowering Aikido" workshops with Dan Harden on Oahu in Honolulu and Kaneohe and in Hilo on the Big Island of Hawaii. 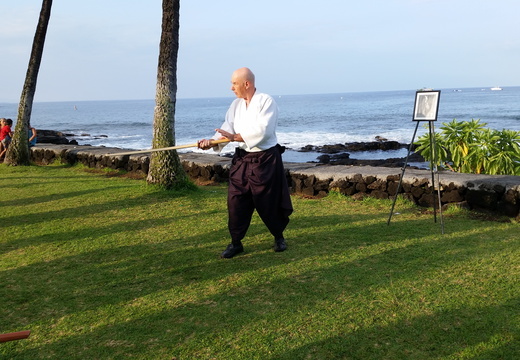 These workshops, hosted by the Aikido Sangenkai, Windward Aikido Club and Hilo Seishikan Aikido, are a continuation of workshops with Dan held in the Hawaiian Islands since 2010. The workshops included participants from Hilo Seishikan Aikido, Aikido of Hilo, the Aikido Sangenkai and Aiki Kai O Kona on the Big Island, and the Aikido Sangenkai, Windward Aikido Club, Hawaii Betsuin Aikido Club, Mililani Aikido and the Aikido Ohana on Oahu, as well as visitors from Australia, Japan, California, Texas and Thailand. Aikikai 7th Dan William Gleason Shihan's second seminar in the Hawaiian Islands. 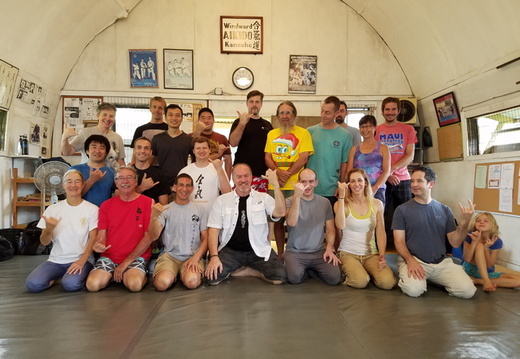 This year's seminar commemorated the 26th Anniversary of the Aiki Kai o Kona dojo in Kailua-Kona, Hawaii. William Gleason studied Aikido from 1970 to 1980 at the main world headquarters (Hombu Dojo) in Japan and also with Yamaguchi Seigo Shihan. During that same period, Gleason Sensei studied swordsmanship (Kashima Shin Ryu) as well as Japanese language, classical music, and Eastern religion. Since 1985 Gleason Sensei has continued to practice and teach under the auspices of Mitsugi Saotome Shihan and the Aikido Schools of Ueshiba. Gleason Sensei founded Shobu Aikido, Inc. in 1980 in Boston, Massachusetts, and there are presently five Shobu affiliate dojos from the Midwest to the East Coast. He is the author of "Aikido and Words of Power: The Sacred Sounds of the Kototama" and "The Spiritual Foundations of Aikido", which has been translated into four languages. Photos from a the "Basic Principles of Aiki and Internal Power" workshop with Chris Li and Mert Gambito of the Aikido Sangenkai. Held in Hilo, Hawaii on March 9th 2014 and hosted by Hilo Seishikan Aikido. Photos thanks to Jamie Yugawa. Photos from a the "Basic Principles of Aiki and Internal Power" workshop with Chris Li and Mert Gambito of the Aikido Sangenkai. Held in Hilo, Hawaii on February 2nd 2014 and hosted by Hilo Seishikan Aikido. Most of the photos are thanks to Jamie Yugawa. 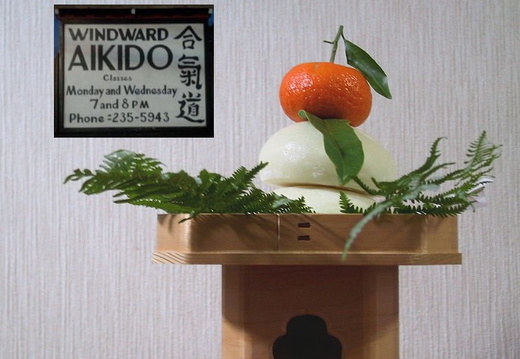 Kagami Biraki, Monday January 13th 2014 at Windward Aikido Club in Kaneohe, Hawaii. 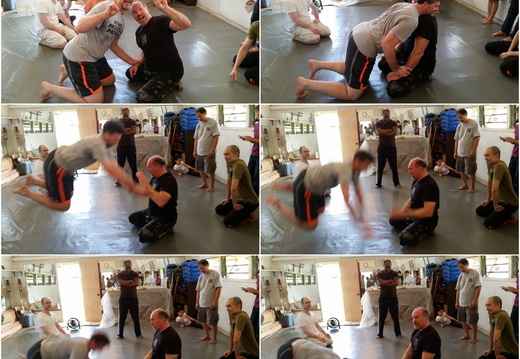 Photos from the December 2013 "Internal training, Aiki and Empowering Aikido" workshops with Dan Harden on Oahu in Honolulu and Kaneohe and in Kona on the Big Island of Hawaii. 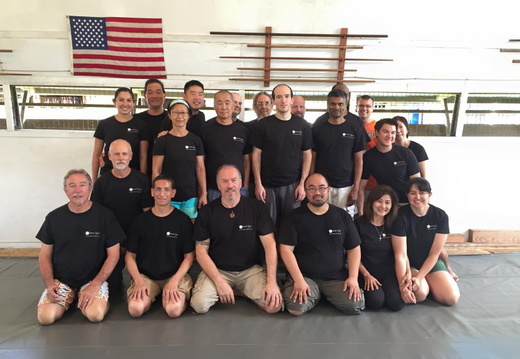 These workshops, hosted by the Aikido Sangenkai, Windward Aikido Club and Aiki Kai O Kona, are a continuation of workshops with Dan held in the Hawaiian Islands since 2010. The workshops included participants from Hilo Seishikan Aikido, Aikido of Hilo, the Aikido Sangenkai and Aiki Kai O Kona on the Big Island, and the Aikido Sangenkai, Windward Aikido Club, Hawaii Betsuin Aikido Club, Aikido of Honolulu and the Aikido Ohana on Oahu, as well as visitors from Australia, Japan, California, Oregon and Ohio and Meyer Goo sensei.